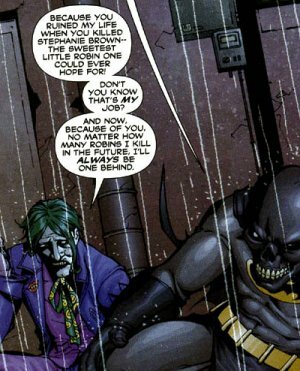 Stephanie has never fought or spoken to the Joker, but she did help Batman and Huntress track him down in the "Last Laugh" crossover. The premise of the crossover was that the Joker, thinking he was dying, unleashed havoc, infecting several fellow villains with Joker venom, driving them insane. His actions appeared to have led to the death of Tim Drake, therefore our trio had to track down Nightwing to stop him from killing the villain. She was present when Joker was revived from his "death" in Last Laugh #6, but was mostly focused on Tim (who was all right after all) at the time. In Last Laugh #3, Barbara told Stephanie and Cassandra she didn't want them anywhere near the Joker, because "he has a thing for Batgirls. And Robins. And by extension girlfriends of Robins." She got very angry when Stephanie was flippant about the situation, grabbing her and saying that if she wasn't careful she'd end up as "a display case and a bunch of flowers." In the War Crimes, the Joker attacked Black Mask for "killing" Stephanie, because killing Robins was "his job". He screamed at Black Mask that now he'd never be able to kill the "sweetest little Robin one could ever hope for" and referred to her by name. He said now no matter how many Robins he killed, he'd always be one behind. Considering this, he'll probably be quite happy to hear she's really alive now.